News, Views and Comment from Dave Nellist and the Socialist Party on issues concerning St Michaels Ward and its residents. Shortly before Christmas former Cllr Dave Nellist, on behalf of the Charterhouse community, asked the City Council to defer any decision on the legal status of the Charterhouse Fields. As long-standing residents will know Dave had made an application on our behalf for a “Village Green”. This was to give us legal protection for our community’s continued use of the Fields and to limit the expansion of Blue Coat’s control of the park. The new Blue Coat Academy uses part of the area as a playing field. Despite huge opposition from the local area, it was granted a formal lease from the Council in 2011 gaining new legal powers over land. The Village Green application was seen as the only way to maintain our community access and prevent further development on our local fields. As a result of the successful ‘holding operation’ of the Village Green application, things have moved on. The strength of the residents’ organisation and the work done over a number of years by Socialist councillors paid off. When the Charterhouse building itself was being disposed of by City College, working together we halted that sale. Now the fields around the Charterhouse could form part of much wider proposals for a large Heritage Park being worked up by the Charterhouse preservation trust. The determined campaign by residents supported by work of Socialist councillors was key to all that coming about – without them there was a real risk that the Fields would now be lost to us. “I am proud of the way this local community stood up for itself. And because of residents’ principled stand the relationship with Blue Coat has started to improve over the past year. The ambitious plans now for a fantastic new park centred on the River Sherbourne and The Charterhouse could benefit everyone. There are serious proposals to relocate the school’s use of playing fields to south of the railway line. I am still working with local residents in a positive manner on these plans. It seems only right that we defer consideration of the Village Green application to see whether those plans can be delivered. Lets keep up the good work together! Former city councillor, Dave Nellist, has called for an end to Bedroom Tax evictions. The call came as the Leader of the Labour Party, Ed Miliband, was reported, by the Sunday People (01 Sept), as planning to announce later this month that a future Labour government would scrap the Tax. “If the announcement takes place, and if it is honoured, that would be welcome. But if Labour now finally agree that the Bedroom Tax should not exist they should immediately take measures to shield people from its consequences. Firstly, where councils own housing stock, or where councillors sit on housing association boards, they should immediately halt enforcement measures against tenants in arrears. Secondly, councils should step up discretionary housing payments to all affected tenants so no one goes into arrears because of the Tax. And Labour nationally should announce a future Labour government would reimburse any council for spending, using reserves, or borrowing to protect tenants between now and the abolition of the Tax. Mr Nellist has been speaking at a number of meetings in the Midlands setting up ‘anti Bedroom Tax’ groups following the suicide in May of 53 year old grandmother, Stephanie Bottrill, of Kingstanding, Birmingham. The groups have set up networks to support people in arrears, and to organise community opposition to evictions. “Whilst this Labour announcement would be welcomed, on its own it’s not enough to reverse the savage attacks which have taken place on working people in general, and on the poorest sections of society in particular. Ed Miliband needs not only to promise to scrap the Bedroom Tax, but announce policies to end the indignity of the need for food banks, to reverse the cuts in the real value of benefits, to lift real wages and pensions, and to end the growing scandal of zero hour contracts which for many hundreds of thousands of young people are the only alternative to long-term unemployment. It’s getting harder and harder to tell the big three parties apart. See an MP on the TV and it’s not until their name tag comes up you can tell whether they’re Tory, Lib Dem or Labour – they all sound the same. They made the financial mess and are making us pay! As if it’s our fault that this city, once the richest working class city in the country, is now best known for having the fastest growing food banks! And local politicians are just as bad. In the 5 years since this financial crisis started hundreds of local jobs have been axed, workers across the city have had wages frozen, or cut. Less workers, with less money in their pockets, has led to 1 in 7 city centre shops standing empty! Years ago you could at least tell the difference between the 2 big parties; Not any longer. When the Council met to decide how many local services to cut – cuts, for example, that threaten 10 youth centres and services for the elderly, and are threatening families with eviction for being unable to pay the Tories’ bedroom tax – not 1 councillor out of 54 voted against! For the first time in nearly 40 years the budget vote on the Council that night was unanimous – Labour and Tory councillors united in saying that local people have to suffer more for the bankers’ gambling. Not one councillor voted against – that has to change! In Parliaments Budget debate, Labour’s Shadow Chancellor Ed Balls emphasised that a future Labour government would NOT reverse the cuts or the Tories hated bedroom Tax. Instead he pledged Labour would use the Con-Dem cuts as a starting point for more cuts! In June – in one of those “you couldn’t make it up” moments – MPs pay body IPSA recommended a £11,000 a year rise! MPs have presided over a 9% cut in average wages, while food and fuel prices are rocketing. They stand idle while 1 in 5 of Coventry’s young people are unemployed. And they think they’re worth a bigger rise in their wages than a person on the minimum wage gets for a whole year! Well socialist politicians are different. The Socialist Party has consistently argued that being an MP or a councillor shouldn’t raise people above the people they represent. They should only receive the average wage of skilled workers in our city – not 2 or 3 times the salary, and five times the holidays, of the rest of us. And we have a track record to prove ours isn’t an idle boast. We did it!When the BBC wanted to contrast someone with the MPs pay rise they profiled Coventry Socialist Party member Dave Nellist. Dave, MP for Coventry South-East in the 1980s, is famous nationally for only taking the same wage as the people he represented, and giving tens of thousands of £s to local and national campaigns. FOR WORKERS MP’s ON WORKERS WAGES. ‘Dave Nellist : The Coventry MP who gave away half his pay’. ‘Mr Nellist, now 60 and still an active member of the Socialist Party… had worked in a factory for many years. He only accepted the average wage of a skilled Coventry factory worker -46% of his salary as an MP-..Mr Nellist said he saw his political career as being akin to that of a union rep in a factory. Dave Nellist (on right) – a true Working Class fighter. 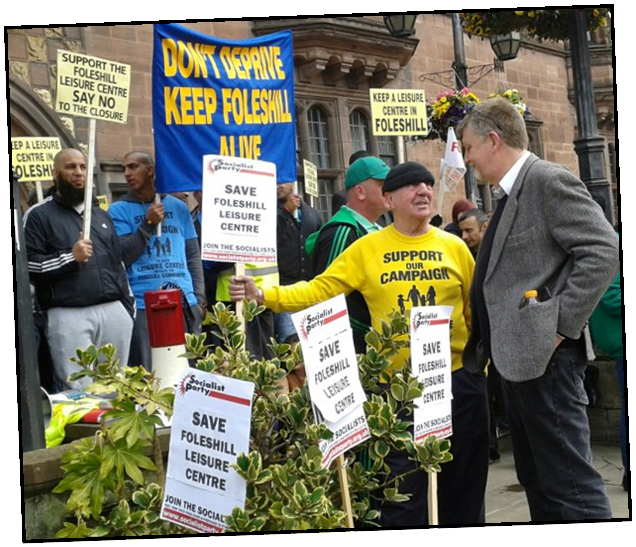 Mr Nellist added that as a Coventry City Councillor for 12 years until 2012, he continued to take home the same wage by reducing the hours of his full time job at an advice agency. Mr Nellist believes councillors and MPs should be able to empathise with the people affected by political decisions. “With a 9% average fall in wages, MPs shouldn’t get a rise – it insulates them from the day-to-day problems like food & fuel which have rocketed. Millions have to get by on much less [than MPs]. That’s why they should be paid only a workers wage. So, like us, they share the pain and the gain”. FIGHT IS ON TO DEFEAT KILLER BEDROOM TAX! 200 people from across Coventry have attended meetings in Hillfields, Tile Hill, Stoke and Henley to organise the fight against the bedroom tax. Dave Nellist opened the meetings and spoke about the death of Stephanie Bottrill from Kingshurst. Her death was a tragedy and no one else must be left to feel that they are on their own in their struggle against the bedroom tax. To get the tax scrapped we must stand together and fight it as a community. 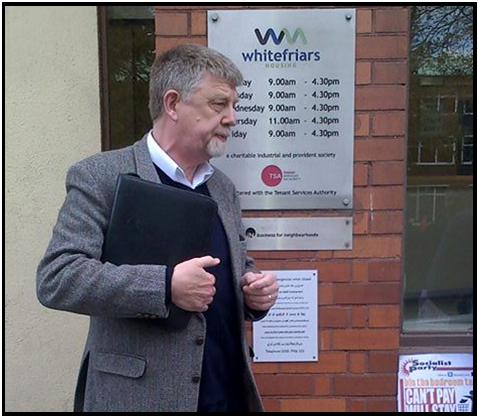 Dave Nellist leading the lobby of Whitefriars. Demanding they take a no eviction policy. 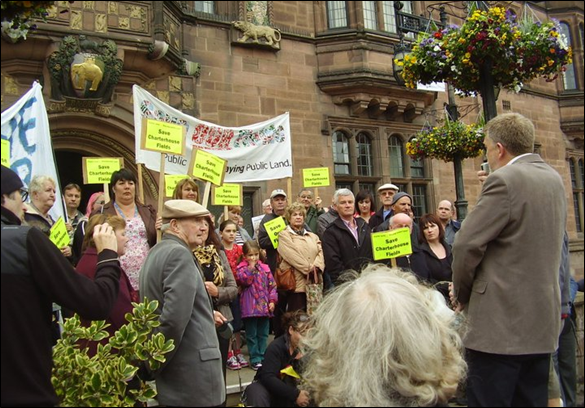 We are building an anti-eviction network across Coventry. A network of people who are prepared to help resist evictions, protest outside court hearings etc. This is so no one is left isolated and we can call on people at short notice to fight against people losing their homes. We need as many people as possible to be part of this – if you can help in any way, please contact us. 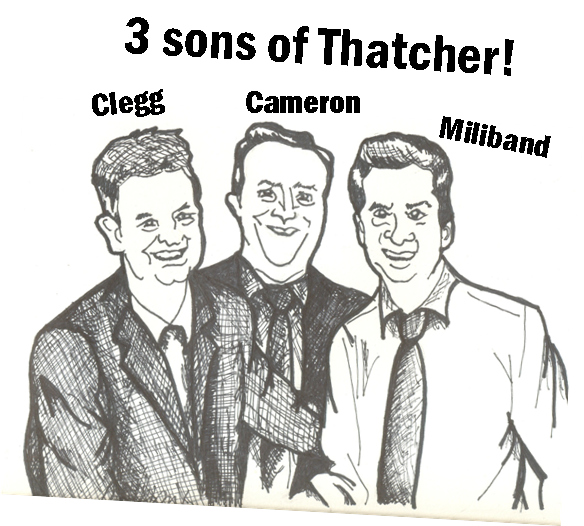 4) Refusing to implement all cuts and build a mass campaign to defeat the ConDem government. So far Labour Councillors in Coventry, who sit on the board of Whitefriars and other housing associations have refused to demand a no evictions policy! Labour Leader Ann Lucas herself even refused to allow an anti bedroom Tax Stall at the Godiva Festival! The People of Coventry or the ConDem government! All the residents hard work may be at last paying off. For years local people, strongly supported by Socialist Party councillors, have fought to keep public access to one of Coventry’s hidden gems, the Charterhouse Fields off the London Road. For the last 2 years our former councillor, Dave Nellist, has kept a block on potential development of the area by submitting a Village Green application – supported by evidence of hundreds of local people. But Dave and the residents haven’t stood still, they’ve been meeting with others who also want to see protection of the Fields, and the restoration of the nationally important historic buildings there – and now there’s movement in the right direction. We hope there’ll be an announcement fairly soon of national funding to restore the historic Charterhouse & make major improvements to the parkland around it. Whilst the Council in the past ignored what local people wanted, socialists & residents working together have proved they are the best defence to the threat of the loss of green space we can all enjoy. Now they taking our Football Club! 7,000 people marched on 20th July in protest against the recent decision to move Coventry City home games over 30 miles away to Northampton. Dave Nellist addressed the final rally in Broadgate. Dave pointed out that back in 2003 the 3 Socialist Party Cllrs had the casting vote over whether the new Ricoh Arena would be built. The Socialists wanted to improve the deal for local people. We got amendments passed, guaranteeing jobs for local people & any profits from sales of land should go back in to services for Coventry people. 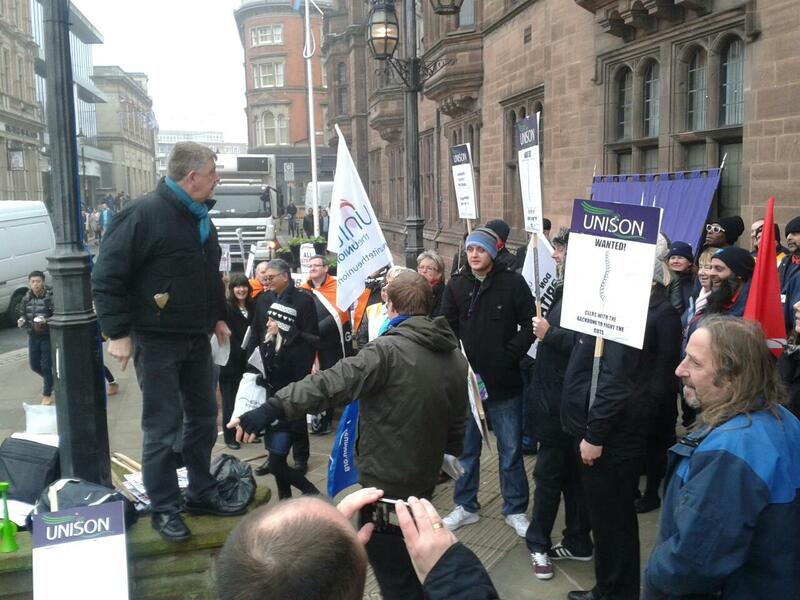 Dave Nellist addresses the rally of thousands in Broadgate. However, Dave pointed out that looking back we should also have moved an amendment to ensure that the fans had a representative on the Board, as they do in many other countries. Dave pointed out to rapturous applause that whilst in other countries there are clubs owned by the fans, we have here a situation where an offshore hedge fund is only interested in raking as much profit as possible from the people of Coventry. The tragedy that has hit Coventry City FC is a perfect example of how profit hungry parasites such as SISU directly attack working class communities, traditions & culture. They must be stopped, with discussions needed on how we can get fan and community ownership and control of clubs, football and sport in general. The Socialist Party meets around Coventry every week on Tuesday, Wednesday & Thursday nights, 7.30. Get in touch for info, about meetings or joining the Socialist Party.